My husband and I purchased a sectional sofa from Suburban in 2016. After only a month, an issue came up that could not be rectified by the Vendor. Suburban stepped in and sent their own tech, free of charge, even though we were over the one year warranty. Although this still didn't rectify the issue, Suburban worked with the Vendor to authorize a new sofa! This is why we keep going back to Suburban. The customer service is excellent. Thank you Mary Beth Politte for getting this done for us! Just wanted to let you know that we love, love, love the chairs. The fabric is so beautiful ( and soft too like a flannelette). Everything else looks good but I haven't spent any time yet in LR so that review must wait. 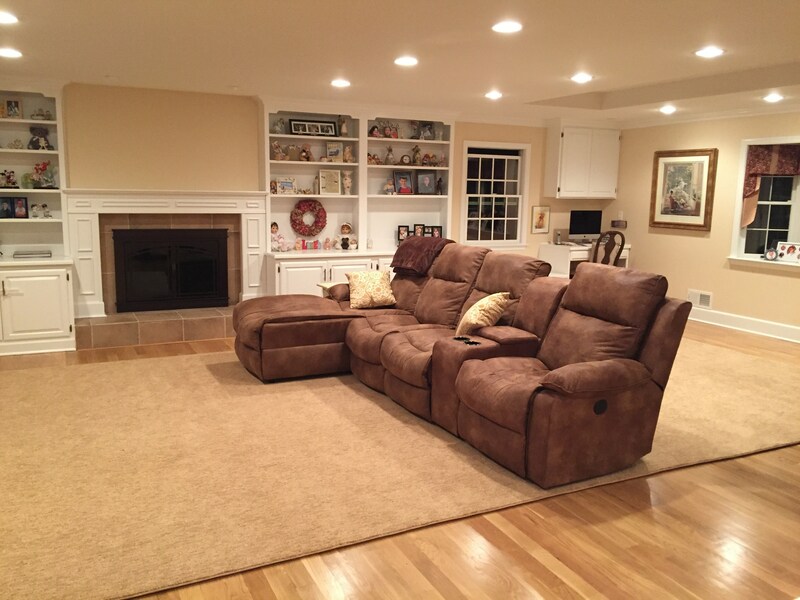 I want to thank you for all the hard work you put into helping me find the right furniture for my family room and finished basement. Your patience and expert knowledge was very much appreciated. You were never pushy and left my friend and I alone for the right amount of time to look at everything and then you were there just when we needed you. I would recommend you to anyone I knew that was going to Suburban Furniture Store. I thank you again for your wonderful help and friendly disposition. You made my friend and I very comfortable and my husband was very pleased with the choices we made. All went well. The crew was fantastic! And everything looks beautiful! We can’t wait for the rest of the furniture to arrive! Please make sure to let someone know how wonderful the guys were today… and how great you and Paul are! Thanks!!! Recently I contacted your store because I accidentally cracked the motor that operates my recliner. You were able to look up my records and to my surprise you told me it was covered under warranty. You gave me the phone number for MFS, the company that processes claims. Your staff is terrific. They were patient and friendly and went above and beyond to help me. MFS was also great. They kept in contact with me, sent a very nice repair man and processed claim quickly and efficiently. I would not shop any place else for furniture. Pleasant service and courtesy are almost lost but you guys still have it. I recently purchased a house full of furniture for my new home. Debi and her husband Gene were so helpful with all of my selections. Everything looks great and fits perfectly. I was able to get the unique look that I was going for. All of the staff at Suburban are kind and friendly. The gentlemen delivering my furniture made it smooth and seamless. They were courteous, polite and efficient. Thanks to all! My husband and I recently purchased a living room sectional and two recliner chairs, We are very pleased with our purchases. We had bought 2 recliners 18 months ago. They were terrible. They were difficult to use and did not stay in the reclining position. We spent a great deal of time at Suburban finding just the right one. Actually we had a couple that we were interested in, all American made. We are super happy with our choice. They are very comfortable, really soft micro fiber fabric. We were able to choose our fabric at no additional cost, plus we were able to have them made in swivel recliner style. Our sectional is exactly what we wanted. Elise spent a great deal of time with us helping us make our decision. The furniture was delivered at two different times and both sets of delivery men were very nice. Our driveway is 1/10th of a mile long and curvy. Both drivers backed down our driveway without going off on the side. Not an easy task at all. We will certainly return to Suburban for all of our furniture purchases! By Diane and Peter D.
My experience with Suburban was better than anything I could expect. Debbie went above and beyond to find furniture for us at great prices. Fernando, I wanted to thank you so much for finding me a sofa that is perfect. Ricardo and his assistant just dropped it off. They were excellent and very nice. It is a true pleasure doing business with you. I will be referring all my friends. Be well. Peace. Debi was wonderful! So helpful and patient throughout our entire experience! We purchased all of the furniture for our new home with them and couldn't be happier! Thank you!! It was a pleasure working with you and meeting you. I said to my mom when we left you were so enjoyable to be around we could have talked to you all day. You are definitely way above most sales people and believe me we have been met with a lot of them trying to buy couches. Suburban has the best selection and prices and I love that it is family owned. I highly recommend working with our salesperson Debi W - she makes the buying experience so easy as she is so patient and also an amazing designer. I look forward to working with her again soon! I love Suburban Furniture! The quality is great, prices is right and they have a huge selection. Definitely ask for Debi Weinstein, she really listened to me when I told her what I was looking for and she has a great eye. I wasn't rushed into making a purchase decision. Hope this brief note finds you well. Just wanted to reach out & let you know how much Ed and I love our new dining room furniture. Although it was difficult to envision it in our home while in the showroom, it goes beautifully with the living room furniture we purchased months earlier. The room looks so much bigger without our old China cabinet . . . a DEFINITE upgrade, indeed! Will touch base regarding the end table for the living room within the next few weeks. Thanks again to you & Paul for your help. Talk soon! Elise - Thank you so much for all your help with my living room furniture. Even after I ordered, I was so nervous that I had made wrong decisions. Picking out living room furniture is just not something that is easy for me. The furniture arrived this morning, and looks BEAUTIFUL! I couldn’t’ be happier with all of your suggestions, and guidance in helping pick fabrics and furniture. My house has been empty for so long because I just didn’t know what to do. I stopped inviting people over because I had no place for them to sit. Thank you from the bottom of my heart. You did us well with the basement too. We use it all the time, and absolutely love the style of furniture that you helped us pick. I wanted to thank you for your patience with the delivery of our couch. Our expansion project is finished and I thought you might like to see how the couch looks in the room! It is sooo comfortable and the entire family loves it! We will definitely be back with any of our future furniture needs. I recently have had the pleasure of working with Debi Weinstein and Paul Kepler. They assisted me in re-decorating my family room. I want to commend their professionalism and expertise in assisting me to make great choices. I am delighted with the furniture they helped me select. 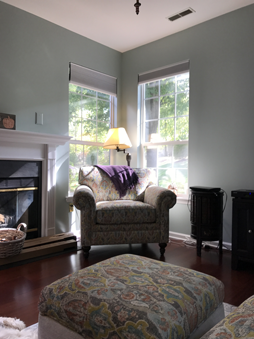 The home consultation is of great benefit in providing Paul and Debi with room size, colors and what I wanted to achieve with new furniture. You are very fortunate to have these two employees who provide great guidance and service...Happy New Year! I just wanted to write you and let you know what a wonderful experience we had with Margot, and the store itself. We recently purchased a sofa and from the minute we walked in, Margot was so accommodating. She had so much patience (I brought 2 young kids with me who both happened to be in a "mood"), was so honest (didn't steer me into purchasing a higher-end sofa - she knew the sofa was "temporary" going into a den with 2 young kids), and even suggested I talk to the designer to help confirm a floor plan. The delivery was prompt and price was more than fair. We would definitely would shop here again. Looking forward to it. Most people start writing you a letter because they were dissatisfied with the service, well, I would like to do the opposite. I started looking for my living room furniture over a year ago, coming periodically to your store and believe me, I'm in sales myself but I wouldn't want to deal with myself. Maybe I'm not difficult but it takes me a long time to make a decision. So after a year most of your sales team kne my first and last name (which was embarrassing!). I have to tell you, your sales people always treated me with a lot of patience, respect and helpfulness. You should be vert proud to have such a sales team behind you. I would like to name Debi Weinstein who stayed with me for my long journey and at the end sold me a beautiful sofa. Her knowledge and patience, always welcoming me into your store with a big smile ended with a positive result for her and me. I don't want to forget your wonderful designer Paul Kepler who spent endless time helping me with selecting fabric, style, etc. I would also like to mention Rob Watterworth who helped me and didn't even make any money on me. He spent time with me after I bought my sofa. Debi and Paul helped me even after my purchase with suggesting carpet and paint colors. That's what I call SERVICE!! You must train and expect a lot from your sales team. Being in real estate, your store will come up every now and then with customers, and I will be recommending your store as the place to go and get beautiful furniture. With a great selection and fantastic salespeople and designers. I can't wait to get my new sofa in my living room! Please tell your sales team, thank you from the bottom of my heart. I am thankful for the amazingly easy and joyful experience I had recently buying a Queen iComfort mattress set from Debi W. at Suburban Furniture in Succasunna. I was only going to do some window shopping that day but I couldn't pass up the mattress deal Debi showed me after I tried it out... and I am so happy I didn't. My new mattress is amazing and my sleep quality has improved significantly since getting it. From being greeted with Debi's warm smile to her professional care and knowledge, to finding such a great deal on a quality mattress set, she made the whole process a dream come true... I am so glad I decided to stop at Suburban that day. Hi Marie, My room looks so beautiful!. The sofa has a warm, inviting look that just makes you want to kick off your shoes and watch a good movie. Many thanks to you and Paul. Tell Paul he was right I should have chosen a stripe. But we love it! We will probably see you in the fall when we start our next room. Thanks again, Sharon M.
By John and Cathy Y. We just wanted to take a moment to tell you about our experience at Suburban Furniture with our sales rep George Bolen. George was great to work with! He is extremely honest, professional and knowledgeable and was able to help direct us to exactly what we were looking for! We purchased our living room and dining room furniture from Suburban and will be back soon to start our hunt for the perfect bedroom set! We are really looking forward to working with him again! Margot, Thank you so much for taking care of the seam and body issues on the sofa. I never expected to get new items - I thought someone with a needle, thread, and knowhow would just come do a repair. This was really above and beyond my expectations. You have a customer for life! Hope all is well. I cannot thank you enough for the assistance provided. I was expecting a simple "we don't sell that anymore - would you like to buy a new bed?" response, but instead you offered spare parts from the warehouse without any prompting or begging from me. Martin was more than helpful when I arrived - scouring the warehouse for rails that matched so the depth would be the same and the mattress would not be on a slant. He also provided materials to make new pegs and explained the whole process very clearly to me, one who is not an expert with tools and minor construction. I'm happy to say that everything worked out perfectly! The bed is sturdier than before and we have been sleeping comfortable since I picked up the parts from the warehouse last Saturday. This high level of customer service is sadly far too rare these days. I truly appreciate your help and will be recommending your store to all of my friends. Greetings! We recently had occasion to visit your store looking for a new loveseat. We were assisted by Margot Gaab . I had to write you to let you know that I have never had a better experience shopping for furniture. She was the consummate professional and just the right mix. She showed us where to look for what we were interested in and then she gave us time alone to look things over and talk. She came back in just the right amount of time to answer questions and she ultimately was able to help us narrow it down. After we made the purchase of the loveseat we reconsidered and decided to upgrade to a full size couch. This was on a Sunday night. I emailed Margot and she responded on Monday, her day off, and changed the order for us and even met my partner at the store on Tuesday, also Margot's day off so Sue, my partner could sign the paperwork. It has been my experience that most salespeople are either hovering or aloof. Margot was neither and it was just a wonderful experience. I suggest you hold on to her because she is truly an asset to your store. I just want to say thanks for your help with the problem we had and we can't say enough about you and Suburban. The new couch and chair are great looking and very comfortable. My wife and I think you went above and beyond to help us. When we get ready to buy new furniture we know were to come. I just wanted to say thank you for your help this past Friday. We are the folks who purchased the white dresser (floor model last one) where we had to go searching for the one wood ball for the side hanger. Well anyway, we got the dresser on Saturday, my father loves it and it looks great in his room. Everything with delivery worked out perfect, we were able to have my mom's memorial mass and by the time we got home early afternoon the dresser was delivered. You have such a cheerful attitude and are very helpful. Suburban is lucky to have you on their team. Have a great week and thanks again! I just wanted to let you know we absolutely LOVE the furniture. It fits great in our space and is wonderful quality. the delivery guys were also wonderful - one of them had been here for our dining table and remembered Fiona. Just wanted to thank you for the wonderful service, I'm so glad we were able to come back to you for a second purchase. Thanks Again! A follow up to my recent conversation with Elise, one of your floor representatives at the Succasunna location. I wanted to thank you again for the spectacular service and support provided during the purchase of our newest couch. They say nothing in life is simple, and as we know ordering this piece of furniture fell into that category. We've enjoyed all of our purchases provided by Elyse and wouldn't hesitate to recommend suburban furniture again. Thanks again for your help and perseverance with this order! The replacement Lane reclining sofa arrived Saturday and it is perfect. My wife is happy, so I am happy. I want you to know that you are one of the reasons we continue to shop at Suburban furniture. The store has knowledgeable sales people, for example, Margot, fair prices, a wide selection to choose from and a service department that truly works on the customer's behalf. It took 5 months for Lane to provide a replacement and you stayed on top of it. And, we had the use of the defective sofa in the meantime. You and the others are the reason why we won't shop elsewhere and why we recommend Suburban to our friends and family. We tell them all that the trip out to Succasunna is well worth the time and effort. Again, thank you for the great service.